Driving lessons in Sunderland, Durham, Hartlepool, Gateshead, Consett, South Shields. Looking for driving lessons in Sunderland, Durham, Hartlepool, Gateshead, South Shields, Consett or surrounding areas? 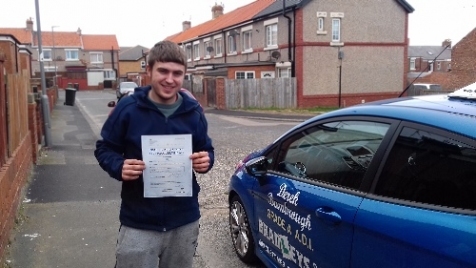 Bradley's driving school has now been established for over twelve years and our excellent rates, expert knowledge and ability to get our clients through the driving test first time has helped us to become one of the leading driving schools in the North East. What our customers really say! Derek was amazing, had previous driving instructors but Derek was twenty times better than them. He’s very patient, explains everything in detail so you know exactly what Is required. Tells you what you need to improve on to make you a better driver. I passed first time with only 2 minors. Highly recommend. That’s an astonishing 59 Zero Faults! OMG! Another clean sheet. 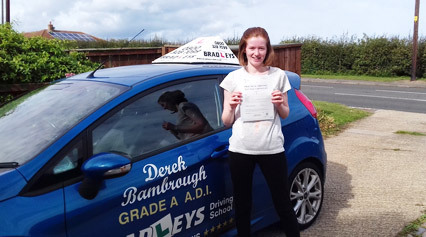 Congratulations to Jessica Heath from Blackhall who passed her practical driving test first time with a CLEAN SHEET on the 21st September at the Hartlepool test centre. Our methods really do work and this strikes home why we think we are your No 1 choice for your driving lessons.